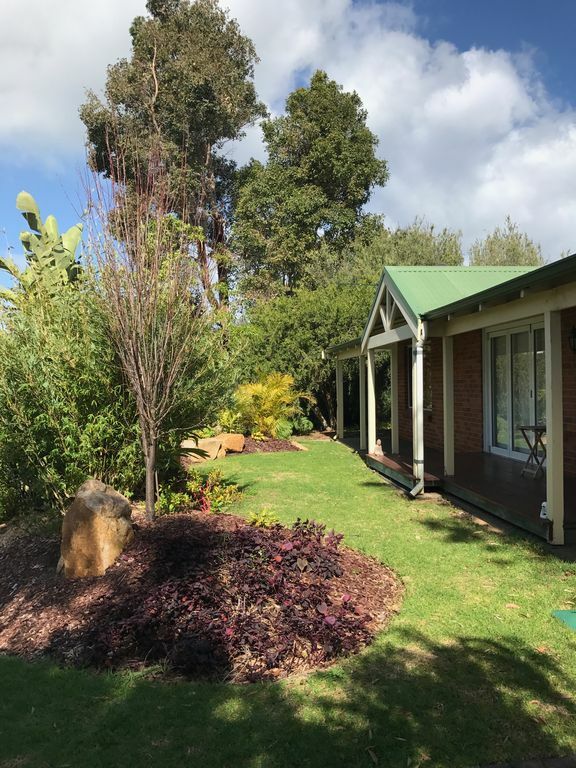 Neat little 3x2 holiday home in the heart of Dunsborough. Walk to town or the bay in only a few minutes. Bali inspired furnishings and gardens. Queen bed has ensuite attached. Double bedroom and single bedroom share second bathroom. Open plan kitchen living area that opens onto front decking. Undercover large back patio with 6 seat rustic dining table. There is also a handy outdoor shower area. Kids and dogs welcome however you may need to restrain them as the perimeter is not fully fenced. Under cover carport and Plenty of room for 3+ cars and small boat or caravan. A cleaning fee of $120 applies to bookings. We retain the right to refuse any reservation, including reservations made online. The person/s or entities registered as or on behalf of the guest/s agree to pay in full all tariffs, surcharges and other charges incurred during the stay at The Glenvale. There is any damage caused to the property, by the guest or anyone invited onto the property by the guest. This includes all items and structures inside the house and all external of the property. The security deposit will be forfeited to the extent of the loss and the matter may be referred to the Police. Security deposits will be assessed and refunded within 7 business days of check out. Holding deposits and fees are non-refundable. In the event of a reservation cancellation being made after check-in or for no-shows, there is no refund applicable. Security deposits for no-shows shall be fully refunded within 24 hours of notification of cancellation of the booking. The owners will make every effort to ensure the property is available as booked. However the owners reserve the right to make alterations to, or even cancel bookings in the event of unforeseen circumstances. These include any and all situations where the house becomes unfit to accommodate guests due to unforeseen mishap and or damage that cannot be repaired in time, changes in local government regulations, and or other legal requirements. Should such an unlikely cancellation or alteration need to be made, you would be notified as soon as possible and full reimbursement of your tariff made. The Glenvale offers self-service express check in and check out. The home has a key safe located at the property; this will contain the keys to the property. No later than two days prior to your arrival, the access instructions, including: location details, car parking instructions, and access codes to your key safe will be emailed through to you. Check-in can occur 24 hours a day, 7 days a week, within the allocated times. Check in is from 2pm daily and check out is by 10am. Car parking for up to 3/4 vehicles is provided. Guests park their vehicles at their own risk. Guest/s shall be liable for any loss, theft or damage to keys, furniture, fixtures and all fittings in the home. Fair wear and tear excluded. The owners shall not be responsible for, or liable to compensate for, the loss, theft or damage and loss of business to any property whatsoever brought onto the premises. There is any damage caused to the property, by the guest or anyone invited onto the property by the guest. This includes all items and structures inside the home and all external areas of the property. It is our policy to have all locks changed if keys are lost or not returned. All associated costs will be deducted from the bond. Similarly any remote controls will be replaced at your cost if lost or not returned. Extra charges including any breakages, theft or damage will be deducted from your bond or if total is greater than your bond amount you will be invoiced for balance owing see above for Bond conditions at the end of your stay. In the event you lock yourself out of the home, a $100 call out fee will be charged to unlock the home. Guests are expected to leave the properties in a neat and tidy state without the need for extensive, excessive cleaning. You are responsible for all cleaning charges in the event that the property is left in a state that requires more than standard cleaning. A minimum of $100 will be charged in this event. The removal of consumable items from the property which are provided for guest use whilst in-house and are not intended as individual use presentations examples include laundry powder, dishwashing liquid, toilet paper and tissues etc. For all guests' convenience, we have a strict non-smoking policy. A minimum fee of $500 applies to those not observing this policy as detailed under “No Smoking Policy”. We actively enforce a strict No Smoking Policy inside the property; this is for all guests' comfort and enjoyment of the property. For the convenience of smokers outside areas may be used e.g. the front deck. A penalty fee of a minimum of $500 applies to those not observing this policy and will be deducted from the bond and more if the property is not able to be remedied due to the smell. We enforce a No Party and Excessive Noise Policy. No parties of any kind are permitted on the premises. Any persons whether they be the registered guest or a visitors found to be creating excessive noise, having a party in the home, or exceeding the maximum number of permitted guests will be evicted without refund. Any subsequent damage will be charged to the registered guest. The number of guests in the home/s at any one time shall not exceed the number of guests declared when booking. Should at any time the number of guests in the room/s exceed the number declared, we reserve the right to either charge extra according to the additional number of guests or alternatively terminate the reservation immediately, without a refund. Dunsborough country club and golf course is amazing. PGA approved course. Dinner also available and fantastic. Fabulous house and location right in the centre of Dunsborough. Amazing facilities a definite must for a stay again! Very cute place with everything you need! This was a great stay in Dunsborough, we found a quick short cut walk to town. Beautiful view from the front room window when you wake up in the morning. We stayed 3 nights for a wedding and loved coming back here each night. The host responded promptly with anything we needed to know during the stay as well. Thanks so much for having us! Close to the beach and town. Clean and spacious. It was perfect for our little getaway and so close to town. Would definitely stay there again. Had a great time staying the The Glenvale. House was in a perfect spot and easy walk into town. Great stay, all that we needed for a comfortable stay at the property.